Cattaneo Commercial are pleased to confirm the letting of 57 Queens road, Hersham, KT12 5NE to Surrey Lofts Limited. 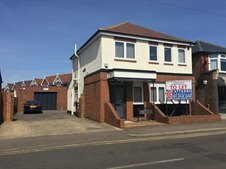 This newly refurbished property comprises a self contained two storey office building of 930 sq ft, a warehouse of 1,950 sq ft and hard standing/driveway with parking for several vehicles. If you are looking to dispose of a commercial property in SW London/Surrey please do not hesitate to contact either Andrew Armiger or David Keates on 020 8546 2166.